Disclosure: I was sent a review copy from the vendor in order to write up an honest review. All the views shared are mine and mine alone. When Savannah starts school in the fall at the Christian academy we enrolled her in, she will be learning sign language, in addition to Latin and Spanish. So, to give her a head start, I recently shared "The Magic Mirror in American Sign Language," one of three titles being released on June 2 from DawnSignPress, that feature an all-deaf cast using ASL to tell the story. Even if you don't know sign language or are just learning, you will be able to follow along as there is voice over and English subtitles. Savannah really got into this DVD and was trying to sign along after watching a handful of times. I have reviewed countless DVDs over the years, but I have to say that this is the first ASL DVD I have received. This DVD is beautifully done and a wonderful addition to the ASL communities assortment of DVDs available, as this is the first one I am aware of. Just because a child can't hear, doesn't mean they can't enjoy the classic storytelling of tales like Goldilocks and Little Red Riding hood like other kids their age. If you know someone who is deaf, you will definitely want to make a point to share this and the other two titles releasing on June 2nd from DawnSignPress. Or, if your child is learning sign language, this is also great to share, and help them learn the correct way to sign, while enjoying these timeless tales. "You know the stories well. You had them read to you dozens of times as a child, your parent’s voice bringing the characters to life. But what are those timeless tales like when performed by a Deaf cast signing ASL? Amazing, fun and totally engaging for everyone, thanks to DawnSignPress, a company well-known for quality children's ASL products, and the launch of their new award-winning Once Upon a Sign DVDs available on June 2nd. Initial three titles in launch are "The Magic Mirror in American Sign Language" - Winner of Parents' Choice Approval,"The New Goldilocks and the Three Bears in American Sign Language" and "The New Little Red Riding Hood in American Sign Language." All are endorsed by KIDS FIRST! and have received the Dove Family Foundation Seal of Approval. Suggested retail price is $15.95 for each of the 25-minute DVDs. Once Upon a Sign re-creates classic children’s stories with clever modern themes performed by an all-deaf cast entirely in ASL with voice-over and English subtitles. Each DVD also features “Fun Signs,” a recap of key signs from the story. "With the popularity of teaching babies sign language parents may be looking for that next step for their children to learn more signs as they grow older," says Joe Danis president of DawnSignPress. "Well, look no more! Children, deaf or hearing, will love watching these stories being brought to life in beautiful American Sign Language. and it's a great way to bring together the deaf and hearing community." In "Once Upon a Sign: The Magic Mirror" young Alice Cogswell wants to enter the talent show but she's unsure of herself. After an audition that doesn't go her way, she gets some magic help. But will this magic help get her to the talent show and help her ASL poetry sparkle? "Once Upon a Sign: The New Little Red Riding Hood" is set in New York City and takes you on an exciting trip through Central Park. Little Wolf will be up to his old tricks, but will Little Red fall for it, or will the Park Ranger save the day? And how will Grandma react to all the excitement going on? In "Once Upon a Sign: The New Goldilocks and the Three Bears," overlooking the scenic California coast a quaint home sits alone. This is the home of the Three Bears, but today, something will change. An unexpected golden-haired visitor awaits them when they return home after a nice, long walk on the beach. 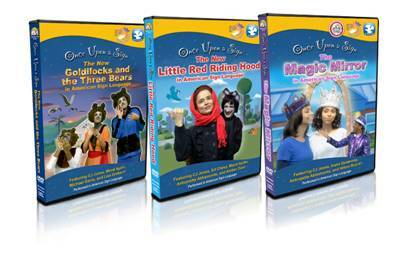 Future Titles in the Once Upon a Sign DVD series include Jack and the Beanstalk, The Stone Soup and Three Little Pigs. For more information on these and all titles in the series, visit www.dawnsign.com." DawnSignPress creates, develops, and publishes quality children's American Sign Language (ASL) videos and books. After 35 years of pioneering ASL products, DawnSignPress is still on the cutting edge of the educational and social media trends relating to ASL Now, with ASL's popularity n the mainstream on a steady rise DawnSignPress looks to offer quality ASL to a wider audience. For more information visit www.dawnsignpress.com. This show sounds amazing and I am interested in seeing it myself thank you for sharing this one I had never heard of it before.